Fifty translation professionals across four continents backed the Slate Desktop crowdfunding campaign on the promise of the world's first Windows translation engine that learns the user's style and protects client confidentiality. Singapore, Singapore, February 18, 2016	(Newswire.com) - ​Precision Translation Tools Pte Ltd (PTTools), Singapore, announces the launch its new flagship product Slate Desktop for Windows, heir to its Linux-based cousin first launched in 2010 and used by technically advanced translators and agencies. 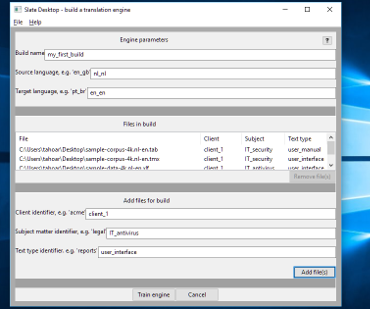 In recent years, new translation automation offerings have relied on Linux-based technologies that restrict applications to cloud-based services. This has left large groups of translators and agencies under-served because they must abide by confidentiality agreements that prohibit entrusting works to the cloud. 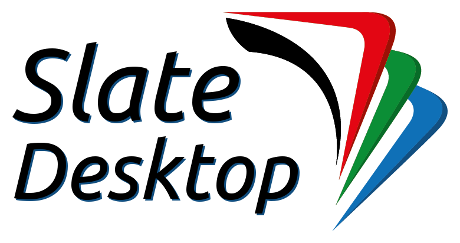 Enter Slate Desktop for Windows, a suite of desktop productivity applications for professional translators and agencies. As the first application of its kind, Slate Desktop addresses the clear yet unaddressed demand for a translation productivity solution on Windows-compatible desktops, still the world’s largest market for business productivity information technologies. Migrating this state-of-the-art translation technology to Windows desktops reduces complexity and lowers the cost of hiring expensive machine translation experts. Now, translation professionals without specialty skills have total control to serve their customers’ specific professional needs, be they medical, legal, financial, manufacturing or technology subject matter. 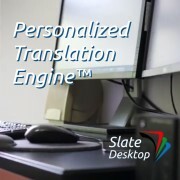 With Slate Desktop, next generation translation professionals learn to convert their translation memories to engines on their on personal computers. This approach ensures client confidentiality and protects translators’ assets. Their choices as professionals determine whether engines are customized to specific products or personalized to a translator's individual style. Slate Desktop for Windows is available exclusively through our new product website www.slate.rocks where backers of the Indiegogo campaign also redeem their Perks. Publish and distribute prepackaged translation software for professional translators and agencies.